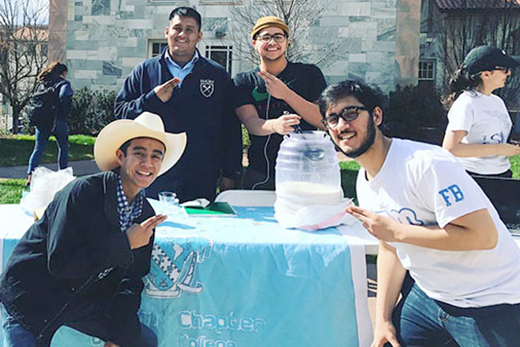 At a Wonderful Wednesday gathering, members of the Emory’s newest fraternity, Lambda Sigma Upsilon, passed out horchata and accepted donations for El Refugio, a volunteer group serving detained immigrants and their families and friends. Participants included (clockwise from top left) Harpreet Singh, Ovidio Vasquez, Joel Ramirez and Jovanny Aguilar. • Pi Beta Phi, Georgia Beta Chapter, a fraternity for women and a member of Panhellenic Council, spring 2016. Website: national. • Lambda Sigma Upsilon, Himalayas Chapter, Emory’s first Latino fraternity and a member of Multicultural Greek Council, fall 2016. Websites: chapter and national. • Delta Sigma Theta, Omicron XI chapter, sorority, spring 2017. Website: national. • Phi Delta Theta, Georgia Beta Chapter, fraternity, fall 2017. Website: national. • Kappa Alpha Order, Epsilon Chapter, fraternity, spring 2018; celebrating chapter’s 150th anniversary with Emory. Website: national. • Sigma Nu, Xi Chapter, fraternity, fall 2018. Website: national. • Chi Phi, Gamma Chapter, fraternity, spring 2019; celebrating chapter’s 150th anniversary with Emory. Website: national. • Emory is home to six Multicultural Greek Council chapters, eight Emory Panhellenic Council chapters, eight National Pan-Hellenic Council chapters, and 11 Interfraternity Council chapters. • Approximately 30 percent of Emory students belong to Greek organizations. • Emory Greek members earned a fall 2016 collective GPA of 3.489. • Last year, chapters donated more than $75,000 to philanthropies and gave over 25,000 hours to community service. • Greek recruitment is deferred until the second semester of students’ first year, allowing them time to adjust to college life before deciding whether they want to become involved with Greek life. After their first year, members may live in their sorority or fraternity house, if applicable. * Figures are based on based on fall 2016 data. Emory's Greek community has welcomed two new chapters in the last year, including the university's first Latino fraternity. Five more Greek organizations are scheduled to return by 2019, setting a record for sororities and fraternities on campus. The growth in Greek chapters, combined with strong academic and philanthropic efforts from existing sororities and fraternities, means the next few years are shaping up to be an exciting and productive time for Emory’s Greek community, according to Marlon Gibson, assistant dean of Campus Life and director of Sorority and Fraternity Life. Lambda Sigma Upsilon became Emory’s first Latino fraternity and a member of the Multicultural Greek Council in fall 2016. The organization was established in 1979 at Rutgers University to “meet the needs of the Latino student population on campus, help students achieve their goals and provide a sense of family to those away from home.” The fraternity now includes more than 70 chapters nationwide. “Some of my friends, now brothers of mine, decided that we wanted to bring a Latino-based fraternity to Emory's campus because there was a need for this kind of organization,” says Joel Ramirez, a sophomore economics major and the Himalayas Chapter president. Lambda Sigma Upsilon was founded on the idea that united voices can make a difference, according to Ramirez, and has a history of fighting for equality, educating minority communities and promoting academic excellence among minority youth. Although it is Latino based, the fraternity welcomes members from many backgrounds. “Our goal is to improve minority communities and be of service to the underrepresented,” Ramirez says. He adds that his chapter looks forward to working with Greek and other campus organizations to serve the community, especially supporting AIDS research and awareness, a commitment shared with the chapter’s national organization. In spring 2016, the Georgia Beta Chapter became the national organization’s 139th active chapter and the newest member of Emory’s Panhellenic Council. Two returning fraternities with historic Emory ties are also looking forward to major anniversaries. In 2018 and 2019, Kappa Alpha Order and Chi Phi, respectively, will celebrate 150 years since their chapters were established on the Oxford College campus. Clearly, the Greek community at Emory — which includes about 30 percent of the student body — is growing. While establishing new chapters and welcoming back others, Emory’s Greek sisters and brothers last fall earned an average GPA of nearly 3.5. Sorority and fraternity members also still find time to contribute to the university community and the larger society. Last year, Greek chapters at Emory donated more than $75,000 to philanthropies and gave over 25,000 hours to community service. Sororities and fraternities are “on a roll,” according to Gibson, who sees myriad opportunities for continued growth and reimagination of Greek life as an essential element of the Emory experience. For more information on Greek life at Emory, visit the Office of Sorority and Fraternity Life website.